Sugar free fruit fudges work well because the fruit you use in your mixture will often bring an added sweetness with it. Raisins, sultanas, cranberries and other dried fruit are incredibly high in natural sugar and will give an extra sugary burst as you bite into the fudge.Try teaming the fruit up with other flavours as well, to create unusual varieties of sugar free fudge. Cranberries work well with apples, for example, and raisins are delicious with ground almonds. And of course chocolate is always delicious with any fruit. 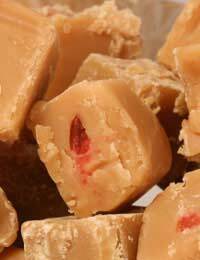 Adults can also choose to add a splash of brandy to liven their fruit fudge up a little! This is a serious fudge to get stuck into. Overflowing with fruit and nuts, it has wonderful bite and is extremely filling. Take a large pan and in it place your cocoa powder, butter and honey. Stir over a gently heat until completely melted and your liquid is smooth. Slowly stir in your double cream. Then add your raisins and your hazelnuts. Pour your mixture into a greased fudge tin and allow to cool. Then place in the fridge and leave to set over night. Once solid, mark out and cut into squares. This fudge uses honey again as a sweetener. Added sugar free apple juice also gives it a sweet boost. Gently melt your butter and honey together in a medium-sized pan. Then stir in your apple juice and your cranberries. Once completely mixed, remove from the heat and allow to cool. After 10 minutes, stir in your double cream. Pour your mixture into a greased fudge tin and leave to cool. Then place in the fridge over night to set. Mark out and cut into squares. The fruit in this recipe is sultana but the strongest flavour comes from the orange. Both work with the granulated sweetener as a sugar replacement. The combination of the strong chocolate with the rich fruitiness of the orange and sultana will create a delicious winter fudge. Melt your butter, cocoa and sweetener in a large pan over a low heat. Stir until completely dissolved. Add your vanilla essence and stir again. Squeeze the juice from your two sweet oranges and grate the zest from the fruit. Stir both the orange juice and zest into your liquid. Remove from the heat and allow to cool. Then stir in your cream and your sultanas. Pour into a greased fudge tin and place in a fridge over night to set. Cut into squares the following day.